The Northeast face of Notchtop had been on my "to do" list for a long time, but I'd never quite gotten around to actually climbing this route. 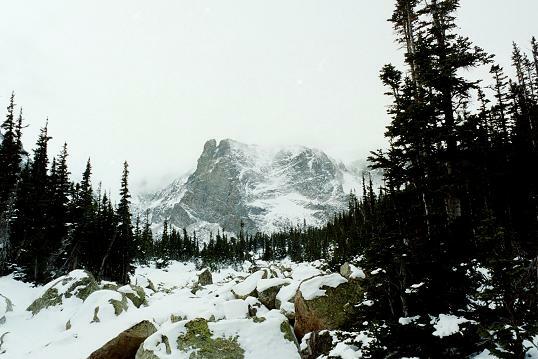 In November of 2007, conditions in Rocky Mountain National Park were cold but snowfall had been sparse, so things were looking optimal for a climb of the Northeast face. I teamed up with Kirk, a climber I had met via a Summit Post posting. He seemed like he had compatible goals and outlooks on climbing, so we decided to hook up and climb together. He spent the night at my house, and we got up early and drove to the Park before dawn. The hike in was pretty uneventful, but when the mountain finally came into view, it looked pretty imposing, and much larger than I had imagined. By the time we scrambled our way to the base of the mountian and up the approach chimney, the sun was barely beginning to shine on the route. Up close, and with some sunshine, the route looked quite a bit more manageable, and I began to become a bit more confident. 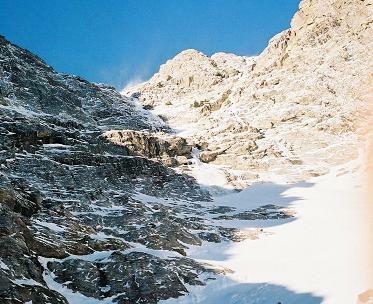 The Northeast face route from the base of the climbing. (Click on picture for larger version.) The climbing turned out to be spectacular. The ice was in good shape and was thick enough to take screws easily. I placed a single camalot on the first pitch, but the rest of the climb was protected with screws. I felt comfortable enough to run it out, and didn't place more than three pieces of protection on any pitch. 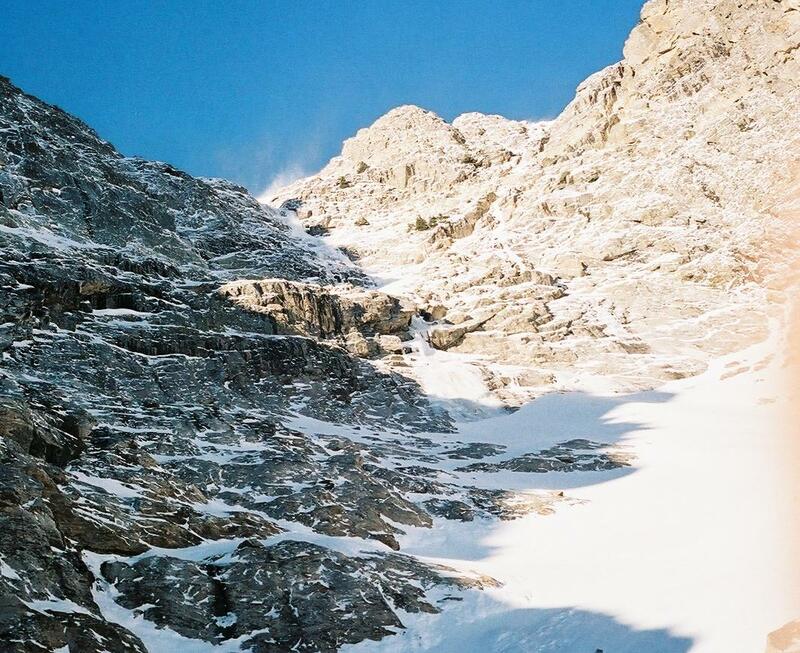 The upper pitches were covered with snow, and I ended up belaying off of buried ice tools and a bucket seat carved into the snow. Luckily, Kirk didn't fall, so my improvised belay anchors were not tested. When we finally topped out, we realized that were were not sure exactly how to get off of the mountain. 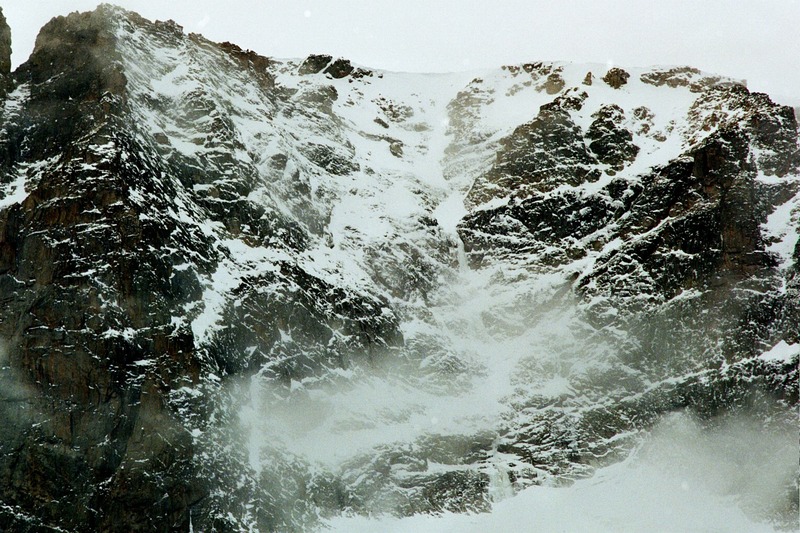 Luckily, Kirk had a cell phone and also had a friend who had climbed this route a week earlier. 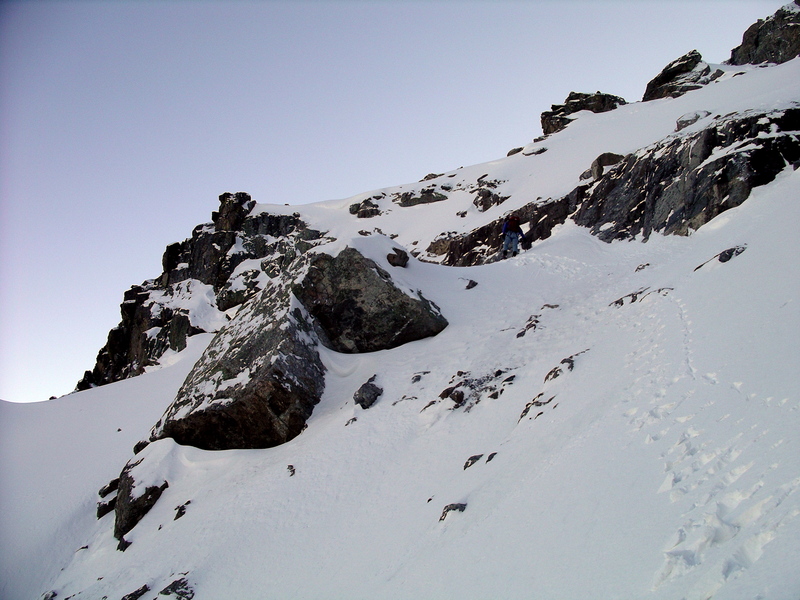 With a bit of beta from his friend, we were soon headed down the descent gully. 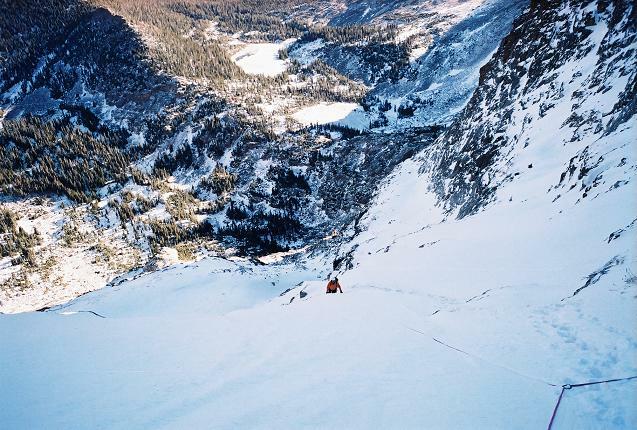 The descent was long and arduous, made even more so after I slipped and pulled a tendon in my groin. Walking down was slow and somewhat painful for me, and we didn't get back down until after dark. Kirk and I enjoyed a terrific meal of Italian food in Estes (a nice treat after a day of eating Gu) and then headed home. Overall, it was a terrific outing. I ended up climbing All Mixed Up kind of by default. I had hired a guide earlier in the season to climb Alexander's Chimney on Long's Peak, but the route never iced up. So, I was left with a fully paid up day of guided climbing that I needed to use. I finally decided that All Mixed Up would be a good way to spend that day. 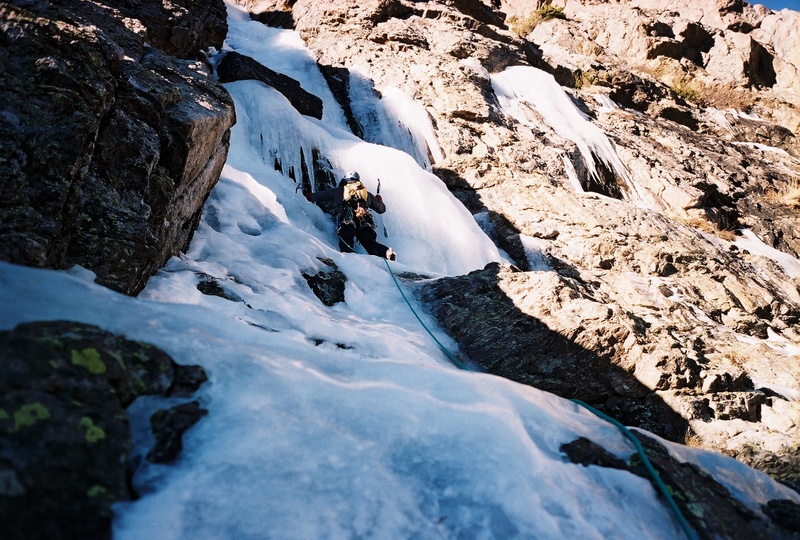 I had attempted All Mixed Up a few years earlier, but had turned back after a couple of pitches due to a lack of ice and an inability to climb bare rock in my crampons. 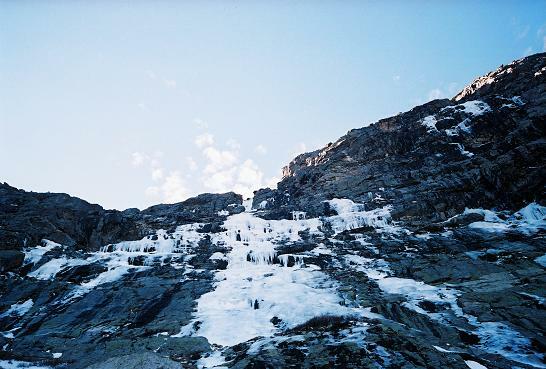 Unlike that earlier attempt, the conditions now were quite good, with ice formed all the way to the top of the climb. The crux (for me) turned out to be the approach. We hiked in before dawn, and I managed to smack my left eye into a pine branch, screwing up my vision in that eye. I kept blinking and trying to clear my vision, but it just got progressivly worse until I could barely see out of that eye at all. This added an bit more difficulty to the rest of the day, as my depth perception and balance were negatively affected by my blind eye. The climbing went smoothly, however, and my guide (Steve Johnson from the Colorado Mountain School) lead the route with ease. I would have been able to follow it easily too, except that my blind eye made climbing quite a bit harder than it should have been. My tool placements were very haphazard and awkward. I was glad I was following and not leading this route.